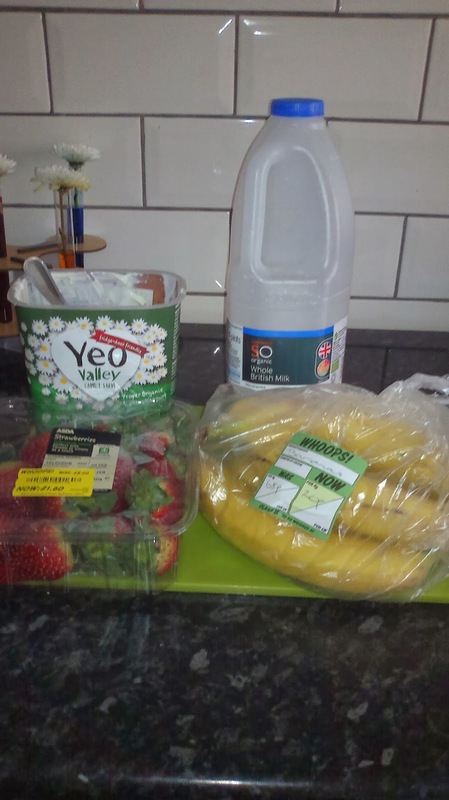 We found some seriously reduced price bananas and strawberries last week, perfect for making smoothies. Here's how we did it. 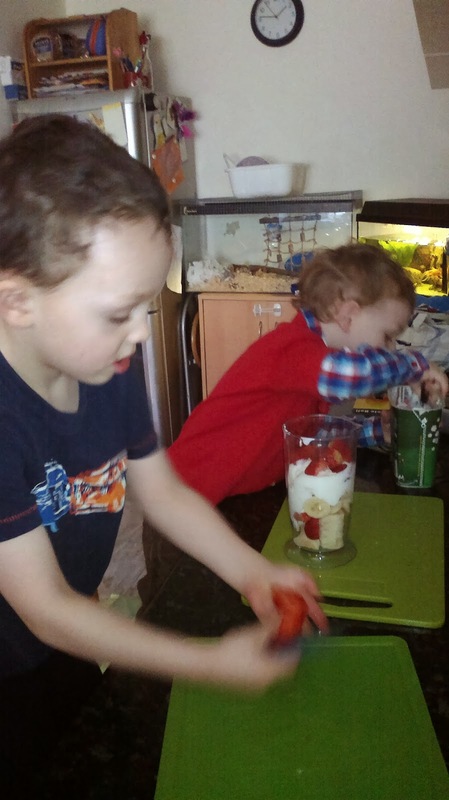 I removed the leaves and stalk from the strawberries, washed them, then gave to the boys along with the peeled bananas to chop with plastic knives. We used about 8 strawberries and 2 bananas. 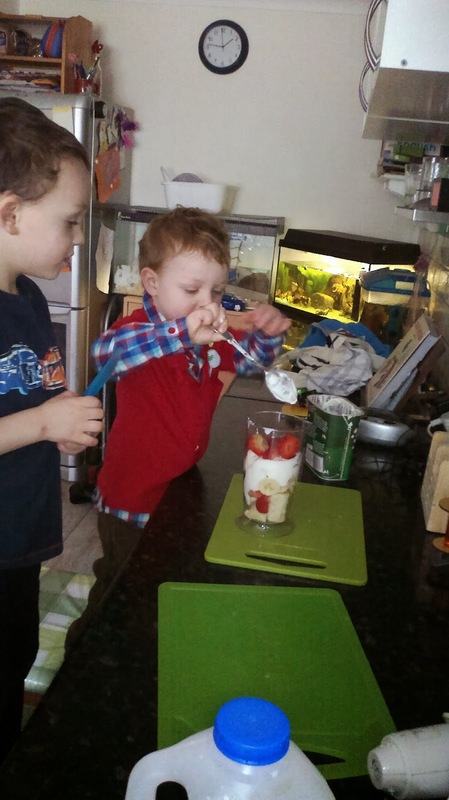 The boys then dolloped in about 8 dessert spoons of plain live yoghurt (Yeo Valley is our favourite, but substitute for whatever brand or type your family likes and can tolerate, for example sheep milk yoghurt is a great alternative). 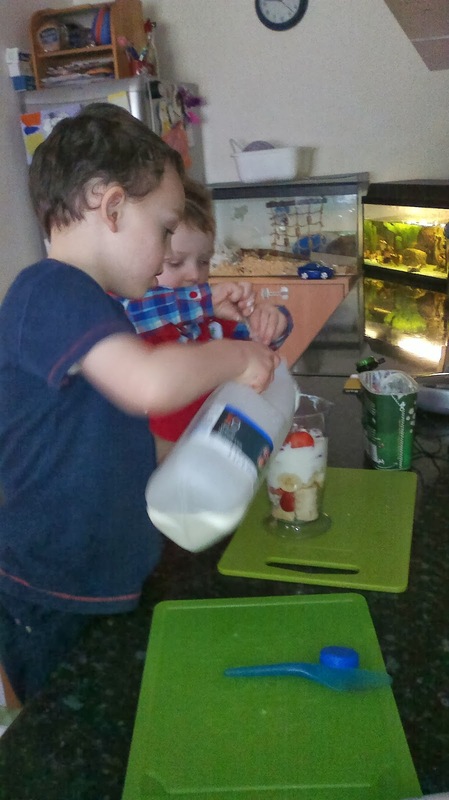 Ollie then poured in some milk (organic full fat, again substitute for your own favourite, we like hemp milk in smoothies too). Toby added a squirt of agave nectar for sweetness and then I held the stick blender while the boys took turns to push the button. The boys helped to pour out the smoothy for themselves and we all sat down together at the table to drink it. This is such an easy thing to make, but the ingredients pack in a load of useful nutrients and fiber. You can talk to your kids during the activity to help them think about the difference between 'healthy' and 'unhealthy' foods. You can engage their creativity in making recipe cards for this recipe, or for new recipes with their own improvements. You can use the chopping of the fruit to talk about numbers and fractions - 'can you chop that banana into quarters for me, that means into four equal sized pieces'. It is also a feel good activity because they are making something with you that they can enjoy pretty much instantly. Strawberries are full of vitamin C - 8 strawberries have more vitamin C than an orange (although since ours were a bit on the aging side this may have been lower - the fresher, the more vitamins is a general rule). They contain good levels of manganese and potassium which are important for building healthy bones. They are also full of antioxidants and are a good source of fiber. Bananas are a good source of vitamin B6, important for healthy brain function, immune response and production of red blood cells. Like strawberries they are a source of vitamin C, manganese, potassium and fiber. In addition they are a good source of a prebiotic which nourishes the 'healthy bacteria' in your gut. The live bacteria in the yoghurt may help to boost levels of healthy bacteria in the gut too. There is evidence that a healthy gut flora helps our bodies to absorb vitamins and minerals from our diet, including a significant effect on the absorption of calcium, provided in this recipe by the milk and yoghurt. The milk is also a great source of omega 3 fatty acids and helps to balance the ratio of omega 3 to omega 6 acids - we currently tend to get too much omega 6 and not enough omega 3. The correct balance is important in healthy brain function. Omega 3s are also really looking like being a key to all sorts of health improvements, from increasing concentration and memory in children and adults, healthy heart function, reduction in skin problems such as eczema and also as an anti-inflammatory to help with joint problems. I'm happy with the research I've done on the internet into whether it's worth buying organic milk, and the result seems to be that there is about 60% more omega 3 in organic milk and 25% less omega 6, although this is based on american factory farmed milk versus pastured organic cows, so the difference may not be as great in the UK. We used to drink semi-skimmed, but since switching to full fat, plus swapping from vegetable oil spread to real butter, and full fat yoghurt, in conjunction with eating more raw foods, I've actually lost weight - 12lb so far since this time last year. A little note about agave nectar. Some (mainly American) websites claim it is just as bad for you as high fructose corn syrup. There are also concerns about it's sustainability as it has gained in popularity as people try to reduce sugar in their diets. My own research of the internet suggests that used in moderation, from a good ethical organic supplier it is a useful addition to the store cupboard. It has a lower glycaemic index, which means you don't get the blood sugar peaks and crashes associated with regular sugar, so it's useful if you want to give your kids the occasional sweet treat without the resultant hyperactivity. However, it does contain fructose, which if consumed in excess leads to a fatty liver, so exercising a bit of common sense in it's use is, well, sensible. I guess it's a bit like maple syrup. Pay £5 a bottle and you'll get the sap from a maple tree, pay £3 and you'll get a bit of sap but mostly just regular sugar syrup and artificial flavourings. Common sense in the amount of fruit you give to kids is good too - it's far better than giving them sweets and processed junk, but it is still a source of sugar and some fruits can be quite acidic on the teeth. 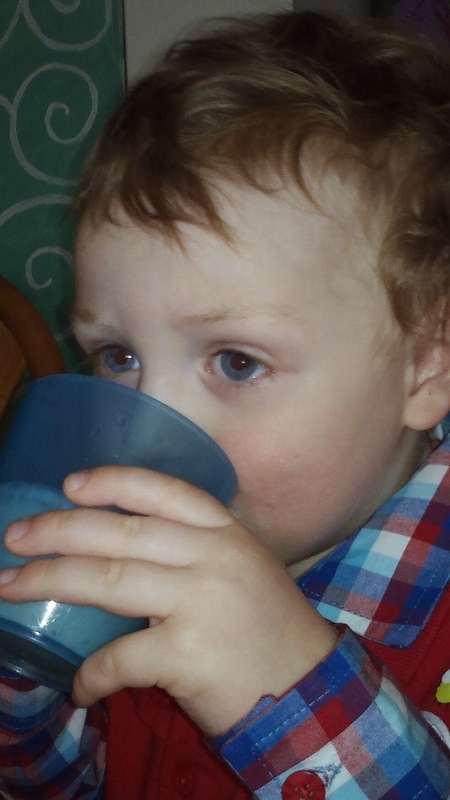 My general rule is to give plenty of fruit but avoid fruit juice most of the time and provide plenty of milk and water to drink after eating fruit. If you can bias your family's fruit and vegetables intake towards a higher proportion of vegetables you will get more vitamins and fiber and less sugar overall. I'm not a nutritionist, but this is just my own thoughts based on what I've looked in to. If you know more, or have different ideas I'd love to here them as I know I have some super fit and healthy folk reading this who are brilliant at all this.